Just before I started planning this post I wondered why there were hardly any song lists featuring Ashok Kumar. I found out soon; Ashok Kumar barely ever lip synced to songs. Hardly ever during the later part of 50s or 60s. Mahal - one of his best movies - no song. 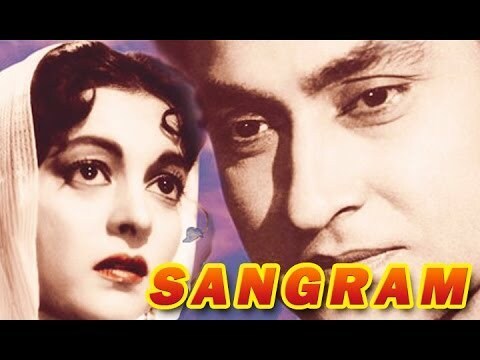 Afsana (old), Deedar, Ek Saal, Parineeta (old), Howrah Bridge, Aarti, Bheegi Raat, Bahu Begum were all movies with fabulous songs, but none that Ashok Kumar 'sang'. Picking his songs was quite like scraping an almost empty barrel. There were songs from late 30s and 40s, but I did not fancy all of them. Surprisingly, he sang some songs during his sunset years, in movies like Khatta Meetha (Roll Roll Makunisa) and the famous Pran and Ashok Kumar song from Victoria No. 203 (Do bechare bina sahare). 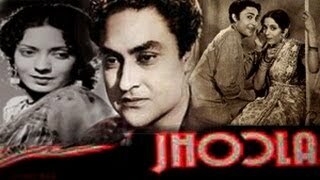 I consider Ashok Kumar as the best actor of Hindi Cinema. He came before the famous trio of Dilip Kumar, Raj Kapoor and Dev Anand, and he rightfully towered above them. Pick ANY film where he had any kind of a role, a benign older brother/father/grandfather, a lead actor, a sidekick, a villain and you will find him coming up aces. In 'Mere Mehboob' I was struck by a scene where he is talking to Johnny Walker who is pretending to be Rajendra Kumar's father. The spotlight of the scene is on JW who is holding forth on how 'great' his family is and Ashok Kumar is reacting to his words. His reactions are so perfect, his eyebrows rise at the right moment, he smiles at the right moment and relaxes on his chair at the right moment. I doubt if we will ever see an actor who acted so well with his entire body. Listing ten songs by Ashok Kumar is not the best way to sample this man's oeuvre, I realise. It would be better to list 10 favorite Ashok Kumar films. In which case one could pick two from each decade as he worked from the late 30s to the late 90s. But I had decided to do a song post on Ashok Kumar to please my friend and soul sister Pacifist Immer who does not like anything post 60s and was dismayed by my Zeenat Aman post. I am writing this in partnership with my friend and soul son (if there is a soul sister, there should be a soul son also) Harvey. He has sadly taken a break from his wonderful blog but has kindly consented to help me with mine (encouraged by the S-word thrown at him by his dearest Anu). I am not going to go into Ashok Kumar's history, and repeat the oft repeated story of how he became an actor. I remember reading an interview by him where he credits Devika Rani with teaching him how to act. She asked him to use his eyes to convey emotions. Later he became a master of his craft, turning it into a high art form. This movie was one of his earliest hits, no doubt it showed him that he was meant to be an actor. Despite being very old, the song is very charming. Harvey: Yup Ava, they sure are using lots of eyes and looks to convey their love and they surely need it. The way he is holding her hand can only convey the affection of a policeman to a burglar. Nevertheless, it's wonderful to see a song filmed entirely in a single frame. Compared to the zappy frame changes nowadays accompanied by loud music, this is like meditation. ban ban bolu re.... ! Harvey: You might have thought at first, what is this song doing in a list of Ashok Kumar’s songs. Most of us are more familiar with the persiflage of this song in Padosan, which was exemplarily sung by Manna Dey, Kishore Kumar and Mehmood. This is the original, sung by Dadamoni himself and that too in the bathroom, while pouring cold water on himself and maybe also on his amorous thoughts at the fantasy or the prospect of a clever lady entering his heart. Ava: What lovely sounds Ashok Kumar makes when he dunks cold water over himself. Here is a wonderfully comic song. The entire sequence is so well crafted. 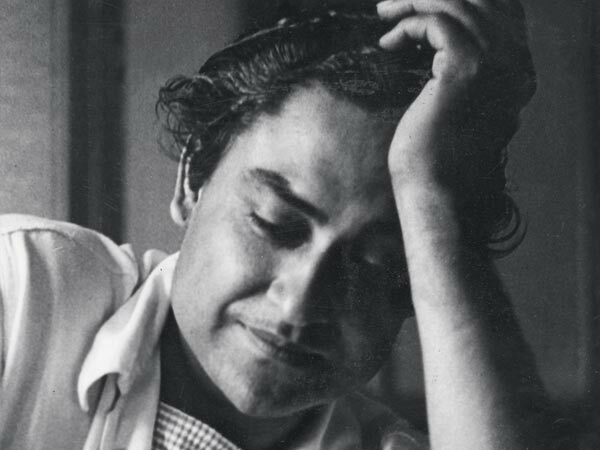 Ashok Kumar lies on a bed thinking of the 'Chatur naar' and singing. Then feeling restless, he tosses his clothes off and pours cold water over himself. I also like the second outing of the song in Padosan, I must say. Harvey: When we think of Ashok Kumar, it is mostly in his roles as a good grandfather or father and in his romantic roles as a good inspector or noble, upright man. One forgets that he scored his biggest with a role, which had him playing a character with lots of grey shades. 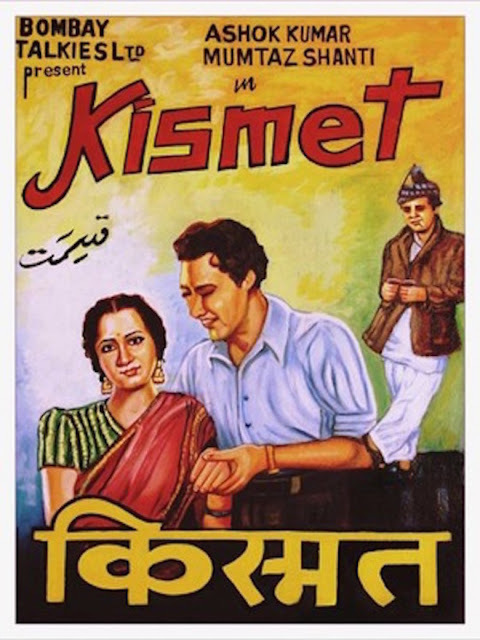 Kismet was, if I have my statistics right, the biggest box-office hit of Hindi cinema till Sholay came along. Ashok Kumar plays a petty thief and a pickpocket. Here he is singing a song to the cloud, asking it not to disturb his beloved in her sleep, but he is self-reflective enough to admonish himself for singing out loud himself. For me this is one of the most romantic songs of Hindi cinema. Ava: If I were listing Ashok Kumar's songs by preference, this one would top it. The song is so beautifully composed by Anil Biswas that it stands the test of time. It is a truly magnificent. This movie is also a reminder to all the superstars that came later what they were up against. The record that Kismet set in 1943 remained unchallenged by any movie for decades. Sholay, we must remember, was a multi-starrer while Kismet was helmed only by Ashok Kumar. I have to thank Raja for suggesting this song. He has written beautifully about Ashok Kumar here. The situation is that Ashok Kumar’s family is very close to Veena’s family. Ashok Kumar’s father is employed by Veena’s father. The occasion is Eid, so Ashok Kumar has come to pay a social visit on the occasion. 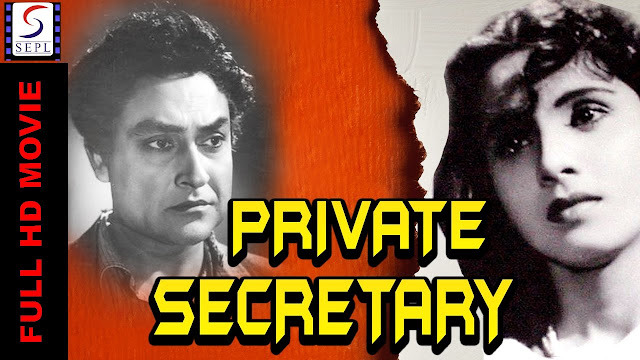 Veena, watching from behind the scenes, decides to have some fun and play a prank on Ashok Kumar. So, while arranging to serve paan from the kitchen, she liberally adds chillis to the particular serving meant for Ashok Kumar. All for fun only, of course. Ava: This is another comic song. Ashok Kumar comes away from eating a chilli laden paan quite smitten by the maker, Veena. I remember my bhabhi doing something similar when she was newly married to my brother. She put heaping teaspoons of chilli into the daal meant for my brother. Quite like Ashok Kumar, my brother ate it with relish. In joint families, with a lot of members around, maybe this was a way of getting the attention of a particular person. Harvey: A wonderful song proving the aphrodisiac qualities of the common chilli. The legendary love potion must have been a salsa sauce. Dear Ava, if this is the prevalent way in North India to get the attention of a person you are particularly interested in, I can just hope nobody falls in love with me, when I'm there. But the last time I saw my face in the mirror, I saw, that I can't hold a candle to Ashok Kumar, so I think, I'm safe. Phew! Ava: According to Arunkumarji Deshmukh Nalini Jaywant and Ashok Kumar appeared together in 11 films. He has written an insightful article about another song from this movie here. Sangram had another lovely duet between Ashok Kumar and Nalini Jaywant swimming and boating in a lake. But I love the lovely lyrics and music of this song. Ashok Kumar and Nalini Jaywant look lovely and playful together. The song is so catchy that I find myself humming it all the time. Ava: Ashok Kumar's pairing with Meena Kumari became very popular, just like his pairing with Nalini Jaywant was. In Meena Kumari, Ashok Kumar found an actress who could stand up to his immense talent. It is sheer delight to watch them together. They are so natural and share a wonderful chemistry. Later on Pradeep Kumar joined Meena and Ashok to make several films. In this triangle, it was Pradeep inevitably who took home the girl. Pradeep Kumar could not match histrionics with this magical couple, but gamely stood his ground, banking on his good looks (don't laugh, folks) and a very good dialogue delivery. I have not seen this film; its youtube link has an intriguing synopsis, and I am tempted to watch it. 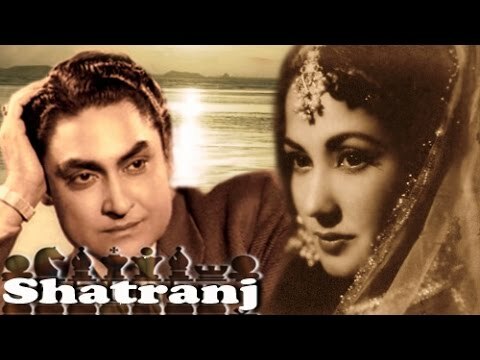 The song has all the elements of the golden period of Hindi film music, a lovely tune, pretty lyrics terrific singers and two good actors making it all come alive. Harvey: When my soul-mother asks me not to laugh, I don't laugh. Pradeep Kumar did look good in films like Nagin and Heer. But what I find shocking is the way, Ashok Kumar is behaving towards Meena Kumari in this song. If somebody is telling you something, one just doesn't brush it aside saying, I have heard about it too. A bit of empathic interest wouldn't have been out of place, I would say. Harvey: I, who was born in the 70s, have grown up on films, where the entry to the villain’s den is paved with bad disguises and good songs. But in 1962, the case seems to have been not too much different. From the looks of it, the heroine seems to be held against her wishes at the villain’s house and our hero comes to her rescue as a classical singer, singing a song, which is full of innuendos. Yes, the disguise is bad, the beard is worse, but the song rendered by Manna Dey is just perfect. 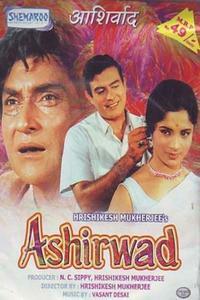 Ava: Here Ashok Kumar is paired with Jayashree Gadkar who was a top actress of Marathi cinema then. Ashok Kumar performs this classical song sung by Manna Dey. Watching Ashok Kumar's perfect gestures in this song, I wonder why he eschewed songs in so many of his films. Did he think not singing lent gravitas to him as a serious actor? Or was it just that the situations in the films did not require him singing songs? This last statement does not seem true as Hindi film actors have sung songs in all sorts of situations. Harvey: I had read somewhere, that when he had started acting, he had great phobia of singing. Once he got used to it just lip-syncing must have needed quite a reorientation, so I can understand him being wary of it. Ava: That could be one reason why he avoided 'singing'. I fear we would fare even worse if we tried to write a post on Balraj Sahni songs. He was another actor (and such a great one) who did not 'sing' much. Harvey: Ashok Kumar gets to play a classical singer again, though not in disguise, but with heavy make-up nevertheless, since he is portraying an ugly person and thus has to be black. Let us leave the plot aside and come to the delightful rendering of the song by Rafi. Isn’t it amazing the way he intonates naache man mora with joy and happiness, that one can’t but believe that his mann is indeed dancing of joy. A masterpiece! 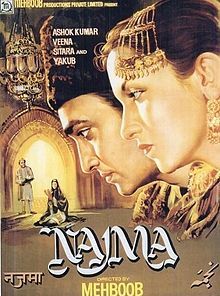 Ava: This was the Indian version of 'The Phantom of the Opera'. Ugly older son is cast out of the family for being beast-like. He falls for the beautiful girl who seems unfazed by his looks. She falls in love with his handsome younger brother. Unfortunate choice of make-up for Ashok Kumar, but very very fortunate choice of music. This movie had a lovely musical score, what's more it had two more songs sung by Ashok Kumar. The very famous Poocho na kaise maine and tere bin soone nain hamare. Harvey: I think, Pradeep Kumar caught the dirty habit of spiriting away women, whom Ashok Kumar loved, around the times of this film. Harvey: I was torn between naav chali and rail gaadi to include in this list. As usual in such cases, I always opt for the charm of the lesser known. This is a short song and the charm of the lyrics lies within the play and rhyming of mundane words like jhandaa (flag) and danda (stick). All the same it narrates a story in this song of a boat journey of an old lady, who is threatened by a crocodile. Ava, don't you think that they just recycled the wig from Meri Surat Teri Aankhen for Aashirwaad. I wonder, why Ashok Kumar didn't sue the art department. Ava: Yes, he does look a bit funny in the 'younger man' get up in this film. But what a film. I remember I cried buckets during the climax. Ashok Kumar spends his life in exile from home, pining for his daughter. The movie had several beautiful songs, apart from the ones Harvey has mentioned. The best of the lot, with due apologies to the delightful Ashok Kumar songs, was this soulfully sung Manna Dey number, Jeevan se lambe hain. Harvey: When even Ashok Kumar starts to move his lips to Kishore Kumar's voice, then we are surely in the 70s. 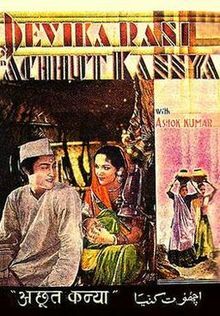 From the looks of it, Kishore Kumar plays the title role of a traveller, who has found a shelter in a house full of grief, where a death of a person has clouded the happiness of all the others. Though the lyrics sound to be full of optimism, the tune lays the deep underlying pessimism bare. Ava: Apparently Kishore Kumar is a habitual traveler who comes to the house of Ashok Kumar and Tanuja and finds that they have recently lost a family member who resembled him. I think Tanuja's emotional state is because of this. I do hope things end happily for them. Sunehriyadein mentioned this song as one of her favorites. It is a twin song from the film Bandhan. Chal Chal re Naujawan is first sung in a school assembly to encourage students. Later Ashok Kumar alters the words a bit to sing it with his sweetheart, a lovely looking Leela Chitnis. I hope you have enjoyed the feast of Ashok Kumar songs (Playlist link) presented here by us. We would love to discover songs missed by us. The readers are at liberty to mention songs where Ashok Kumar is not lip-syncing. It seems a delightful post Ava and Harvey. I will go through it on my computer. I read the beginning and burst out laughing. Thank you thank you ava for catering so fondly to my weird ways. You are welcome, dear Reeba. Anytime! What a lovely post. Totally agree with everything you say in the post. Thank you Bawa. Their chemistry was so good that they returned in a film called Raja aur Rana. Such a delight watching good actors. Here's a playful song with Meena Kumari that I discovered just yesterday. Music by O.P. Nayyar. What a gorgeous song! Thank you, Rahul. Such a cute, romantic song, Rahul. Thank you. Great idea to write this post in tandem, Harvey, Ava. Looooved reading your tippannis!! It was humourous and was also good guidance to appreciating the songs. Checked out the fact that yes indeed the song bann ki chidiyais all in one frame. Focussed on Ashok Kumar's eyes all the time and must say while singing beqarar dil his eyes show all the beqarari he's feeling. A word of appreciation for the selection of posters with each song. A lovely touch. chaar chaand laga diye. As for the shatranj poster! *sigh* kya look hai in Ashok Kumar's eyes. *sigh* again! Thank you Ava and Harvey. Really enjoyed reading and listening to each and every song you listed out. Quite a selection I must say. Thank you for the appreciation, dear Reeba. We both are glad that you liked the post. Ashok Kumar did have nice eyes, the look though he mastered later in the 1950s, I think. I want to see Shatranj. Kaafi intriguing story lag rahi hai. YouTube par bhi hai. Ava, I found out the mistake. 'publish' comes up again and again and I thought I was making some mistake. Ah maybe. Once you are signed in, they will not hassle you. Sorry, I have to put up all these speedbreakers or I get the most horrid spam in my comments. The article has turned out quite well. Thank you, Ava. You didn't want this song, chhupa chhupi o chhupi from Sangram, thus am posting it here. I love it. It was fun writing this post with you. Looking forward to further collaborations. Yes. No touching of the heroine. Oh, Ashok Kumar used props wonderfully. I remember a scene in Bahu Begam where he uses a handkerchief to show the mental trauma he is going through. Ashok Kumar's cigarette shots were really amazing. Thoroughly enjoyed reading this, Ava. It's very well-written - and the expert commentary from Harvey, to add to your observations, is a lot of fun. Need to catch up on some of these songs now. Ashok Kumar is one of my favourite actors too. Yes, I was surprised when I read your write up for the Paan song. Our views were so similar. Do listen to the songs. I have put them in a playlist at the end. They are delightful. This is the first time I have heard this song. If I did see it in the movie, I had forgotten in completely. Thanks you. It is really a unique kind of a song. This time I would not have much to contribute, great effort by the both of you. Oh My God! My own comments are vanishing. Thanks for the recco Samir. This song reminded me so much of 'Raaz ki baat keh doon to'. Fulltoo 70s fun. I go away for a couple of days (and my net connection goes away for longer), and see what I miss! What a delightful post, Ava and Harvey. This was so much fun - and yes, it had never occurred to me before that Ashok Kumar actually lip-syncs to so few songs. I can't think of any solos other than the ones you've mentioned, though if one includes duets and more, there's Babu samjho ishaare from Chalti ka Naam Gaadi. And as for songs which he doesn't lip-sync to, but which are picturised on him, by far my favourite is Chhupa lo yoon dil mein pyaar mera, from Mamta. Love that song! BTW, Balraj Sahni does have some lovely songs picturised on him - Tu pyaar ka saagar hai, Raat bhar ka hai mehmaan andhera, O meri zohrajabeen, etc. I had picked Babu Samjho Ishare, but Harv argued it was a trio song. At the end of it all, I am happy about all the songs I picked. Exactly! After I'd written that comment, I remembered Manzil wohi hai pyaar ki. Another great song which I always associate with Balraj Sahni, even though he's not lip-syncing to it, is Mausam beeta jaaye. And Black Cat, which starred him, has some good songs - I've forgotten which, but I do remember that he was being fairly typical detective-y hero in that. Black Cat has no song either. We have looked already. These are the easy picks, ladies. Challenge starts after song No.6. Watch the space ... by end Jan Harv and I will have something ready. Ah, I love Ashok Kumar! This is such a fabulous set of songs, Ava & Harvey. I don't think anyone has mentioned this lovely Rafi song, "itni badi duniya jahan itna bada mela" from Toofan Mein Pyar Kahan. OMG What a lovely song. I heard this for the first time. Thank You Shalini. Ava, we have to collaborate (Harvey is welcome too) on some 70's song topic. I have one pending for a long time --- Songs of B & C grade Actors & Actresses. Up for it ? Bilqul. I am all for it. We can pick all the nasty masala headache inducing songs. A sort of a 'worst of'. It will be fun. I will need your email address. You can message me on fb. You may like this song for many reasons. Ashok Kumar singing a hilarious romantic song along with Meena Kumari ( I originally thought saying this in Anu's blog sometime ago) in one of her best comic performances. Rafi saab singing for many in a single song and for Nayyar saab's compositionand also for qamar saab's words. Interesting post indeed on Dada Moni ( never missed any of his phillums), I came over after reading DO's pages and if I may add a hilarious number. Thanks Ash. I admire Dada Moni so much. Right from his rather hesitant start to a very confident finish, he was a delight to watch. What a fabulous actor, once he got over his awkwardness in initial films. Thanks for the Chori Mera Kaam song, its a hoot. I wasn't expecting him to be lip-syncing in this film. One more gem to add to our treasure. Now this is really odd. Very valuable information nevertheless. Thank you a lot Ash. Keep them coming. I Am So Very Very Proud!